This has become a family favorite for week night meals as well as leftover lunches! 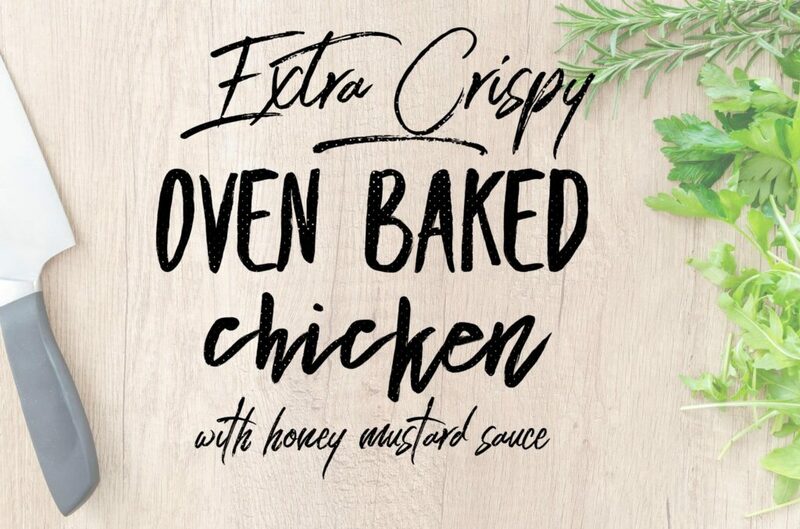 I have also adapted this into chicken strips and nuggets for the kids by cutting the chicken pieces smaller. I hope you enjoy this as much as we do…be sure to leave me a comment on how much your family loves it too! In a shallow dish combine the flour, salt, onion powder, garlic powder and paprika. In a second shallow dish combine the eggs and milk. In a third shallow dish combine the crushed cornflakes and olive oil. Dredge one chicken thigh in the flour mixture coating all sides. Dip into the egg wash coating all sides. Dredge in the cornflake mixture coating all sides. Place on a large baking sheet. Repeat with remaining chicken thighs. 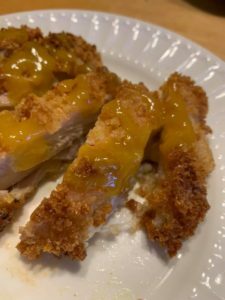 Bake for 45 minutes or until an internal temperature of 165 degrees F.
OPTIONAL (but so flipping good) HONEY MUSTARD SAUCE: In a small bowl combine the mayonnaise, honey and dijon mustard. *To replace an egg, use 1 tablespoon of chia seeds mixed with 3 tablespoons of water and let the mixture sit for 15 to 20 minutes or you can prepare it the night before. Mix the chia seeds and water together in a small bowl and let it sit for 10 – 15 minutes until the mixture becomes gel.